White backlight for optimum readability. Simple, centered insertion of the ribbon with three-part tightening axles. Imprinted rule simplifies ribbon positioning. 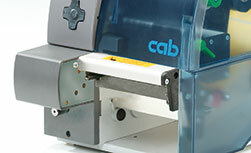 High printing accuracy as the material is located directly behind the print roller. Width adjustment with a single knob. 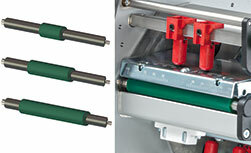 Add-on modules such as cutter, perforation cutter and stacker are easy to connect. Die-cast aluminum. All components are mounted on it. Available for core diameters starting 38 mm (76 mm adapters for improved label winding are provided). The material is automatically centered. 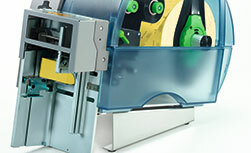 The spring-mounted margin stop ensures constant tension during feeding, thus ensuring high printing accuracy. Up to about 50 labels may be collected in the cutter tray.